Those videos are created to generate ad revenue. I get that, and I realize that most of this is pretty standard fare, but the giant living ice cream throws me for a loop. Like, the fact that it is ice cream has no significance whatsoever. 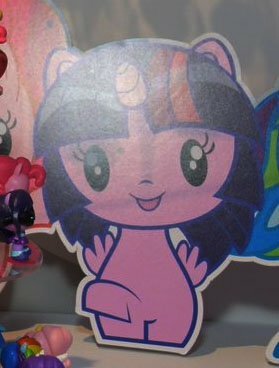 They could have just made it a dog and everything would have been normal. The family just has a giant living ice cream living amongst them and it's just never remarked upon or made relevant in any way, and that baffles me to no end. Like, there's no point to it even being there. Nothing ever comes of it. I was baffled to find that this series is apparently the origin of that "weird YouTube" video with the song between the child and father about whether he's eating things in the kitchen and whether he's lying. I guess the bizarre video that got circulated of that where the father eats the kid in the end was some kind of weird pomo parody. Incredibly pissed off due to the fact that I found out that there's a French version of Saturday Night Live and it's literally called Le Saturday Night Live. theres also a version of its always sunny in Philadelphia but its based in Moscow. Man, that would be an outright black comedy. It should also be titled "It's Always Sunny in Philadelphia", but Philadelphia is never mentioned in the script, and beneath the black comedy of the series is this unspoken, more innocent yearning for this invisible, kinder world. One of those tangible absence, sort of things. Look up the context of this post at your own risk. The surest way to live a full life is to keep in touch with the larger world. You don't really get old until you stop seeking out new experiences. So, no, not super worried about it. As a liberal, I can definitely say I would not support George Washington as a Supreme Court judge in 2018. He's a slaveowner with no experience in the legal system, and he's extremely dead. The biggest reveal was that after I complained two years ago that Hasbro was now limiting their reveals entirely to Toy Fair, BotCon (which no longer exists), SDCC and NYCC, Hasbro's marketing department has apparently realized that they were spreading themselves a little too thin and has since decided that hey, apparently international markets matter a lot more these days, so now reveals also happen at Fan Expo Canada, friggin' Comic-Con Paris and Comic-Con London. I wonder if some reveal also happened at Comic-Con Berlin last weekend and there was simply no-one in attendance who cared? it was behind a bald guy...no one saw it. I will,be eating cake that i stole from an abandoned cake shop. now that i dusted all the cobwebs off it tastes pretty okay. you're welcome to have a slice if you want. There's also a party favor. Singular, because there's only one. It's a penny i found on the street that i think got ran over or something because it's covered in scratches; it looks kinda cool. The coinstar machine wouldn't take it so now i'm giving it to all of you. i hope youenjoy it, and please remember to share. Anyway, hope you have fun at thus party. I realize it's alittle dull, but my plan to rob the bank of switzerland didn't pan out, so i had to make do wirh a smaller budget. How long have you been 12 Joey? How many years must we repeat this? When will you allow the rest of us to be free?! I've had to watch my grandchildren die. And their grandchildren. And theirs. Ethics in a business program? Why do schools insist on teaching people stuff they know they'll never use once they graduate? And then there was Giganodragon from Dinozaurs, who unzips into a dragon scarf. I thought that was a clever transformation. It kinda is. It's in the Jizai Toys category for me of "I have no idea why you did that, but my God, well done, you did" that I really can't bash. Oh no, I've lost the respect of tec. How ever shall I live with myself. The moon landing was real, what they really covered up was the discovery of aliens on the moon. i saw that horror movie. it was not good. I don't know that I'd call Dark of the Moon horror, per say, but otherwise I'm not disagreeing. That's all, I guess. Here's to more fun with y'all in 2019! Edited by Patch, 01 January 2019 - 10:45 AM. Did you mean to link to "That Time An Island In GoldenEye Disappointed A Generation"? Yes. It was a test to see if people actually click on links. You passed. Hey, what's that behind you? In what just world does Revolutionaries get cancelled when the Legends manga is now approaching its 60th chapter? I hate this post, because it made my brain envision a fourth-wall-breaking skit in which the other characters are trying to convince Ian to put on a maid costume in order to save the comic. He's a snake person because he chose to fight Cobra. Wouldn't that make him a mongoose person? 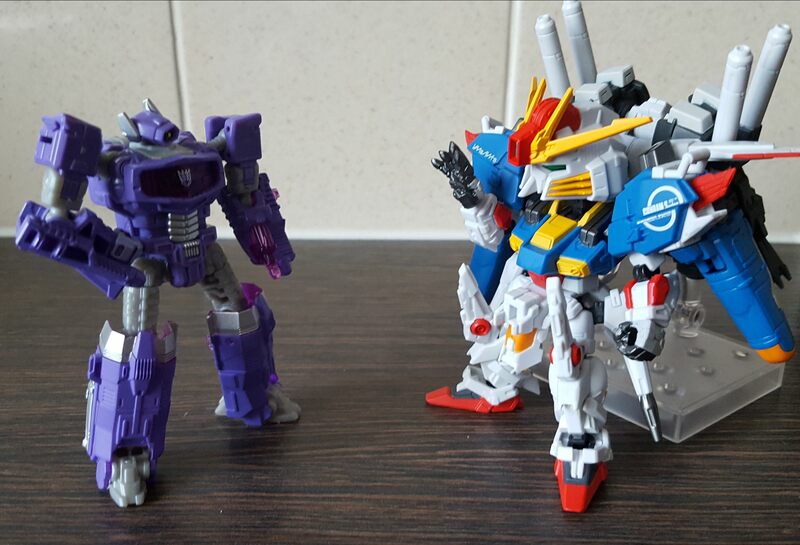 My Starscream's combiner feet are odd. One pegs in very solidly and the other barely pegs in at all and is floppy. I would definitely keep a close eye on Ted Kennedy if I saw him giving a speech. Dude's been dead almost a decade, I'm not about to let him eat MY brains. More to come as the quote limit allows. 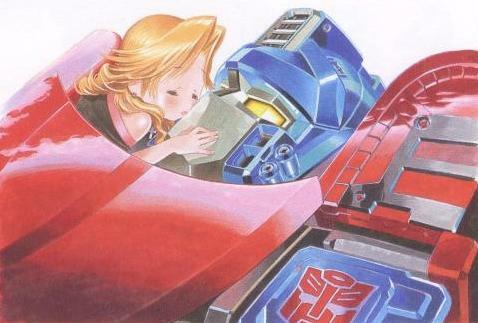 The main beef I have with Victorion is her not being called Slammoth. I fail to perceive everyone else's love for that name. Then your opinion is irrelephant. Mercy isn't dispensed here! Only fantastic bargains! Wait, Primus can't look into Legends Class packaging to see what color the cardback is? Primus sees in black and white. He's stuck in planet mode, so unless you want to take the card down to the big screaming face, he can't see it. Good Saboteur vs Bad Scientist. The battle of intentionally making a weapon blow up in your face vs making a shoddy invention that blows up in your face. This decision is going to be made for us in the next decade or so. 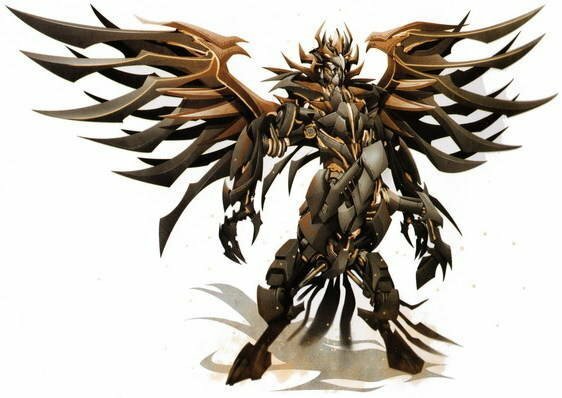 On the matter of the upcoming titan-class Predaking: Tantrum's awful beast-mode head makes me increasingly angry each time I see it. If it's any consolation, Tantrum would almost certainly also hate your head. Random words are bolded reads the post of a man..
A poster of defeatism is the man called Paladin..
May 1st, commonly known as "May Day". Mayday, a distress signal used to signal a life threatening emergency. I could ship to you but I'd have to charge. Qui autem perdiderit animam diabolo. I could go for hundreds of dollars myself. And we could all use a little chaaaaange! Empurata. Shadowplay. The Evil Corrupt Senate. I wouldn't be surprised if a lot of the decline in readership of RID came from Barber driving off people who have themselves remotely detonated their friends' heads. How will Wreck-Gar use the power of the Primes? The Power of the Primes time travels, space travels, Gulliver’s travels, accepts all major insurance and gives greasy dishes that sparkling shine! It cuts, dices, slices, causes terrible plaque buildup, and can be used as both a salad dressing and lethal poison! Get back in the game with the Power of the Primes! 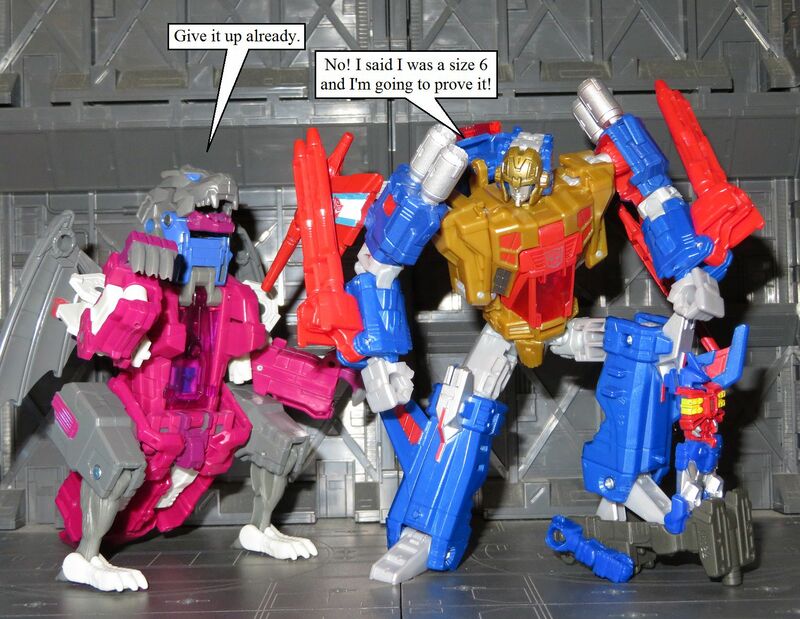 Warning: Power of the Primes may cause frustration, expectation, saturation, and alienation. If you attempt to pre-order Power of the Primes allow between six to infinity weeks for shipping and handling. Not to be taken internally. If using the Power of the Primes for more than four hours, consult a mortician. Power of the Primes may not be available in all states of consciousness. Oh wow, it also seems to include a DRM-free copy of several volumes of the Seven Deadly Sins manga in the bundle. I think I'd like that to have, specifically to lock it in an encrypted archive with a password from Random.org I didn't look at, save it to an external magnetic drive, erase it, format the drive to random numbers, then smash it with a hammer. I have been repeatedly informed that my inaction is decidedly unsexy. So whatever happened with Counterpunch? Any further word on that front? I thought those molds were, like, verifiably long dead. As in, I thought eHobby tried to find them and Takara was like, "Hey, check the bottom of the ocean," or something like that. They, uh, found a way. They filled in the damaged areas of the molds with frog DNA. I want King Primal, Grimlock, and Starscream singing "We Three Kings of Cybertron Are". I assume they bring gold, frankincense and Blurr. Wait, is Teleport a planet? Up for debate. It's neither here nor there. I don't have a problem with Generations doing stuff like this but when the ostensibly "non-G1" kids line is using the Evergreen designs that are like 90% of this aesthetic too I worry we're heading toward the intersection of He-Man and G.I Joe. I'm pretty sure the aesthetic intersection of He-Man and GIJoe is Dr. Mindbender. I will try to think of it as Ox and not Dreamwave. As it stands, from far away Ultra Magnus looks stunning but from close up I get angry because he's going to make the Wreckers ship him pages of art and not pay them. Edited by Cybersnark, 01 January 2019 - 12:21 PM. Action Masters and blind bags of tiniest Titans. Generations including the Cyber Series. These are a few of my favourite Bees. Redecos all coloured in Allspark blue "neon." Imports of Japanese collection EZs. Q-Transformers, Flip Racers, and Alternities. Are part of my Bee hive. Helps me to feel alive. So sad to see Megatron has a wad of chewing gum for a left hand. "I'm here to kick afterburners and chew bubblegum, and... well, luck has given you a few more minutes." 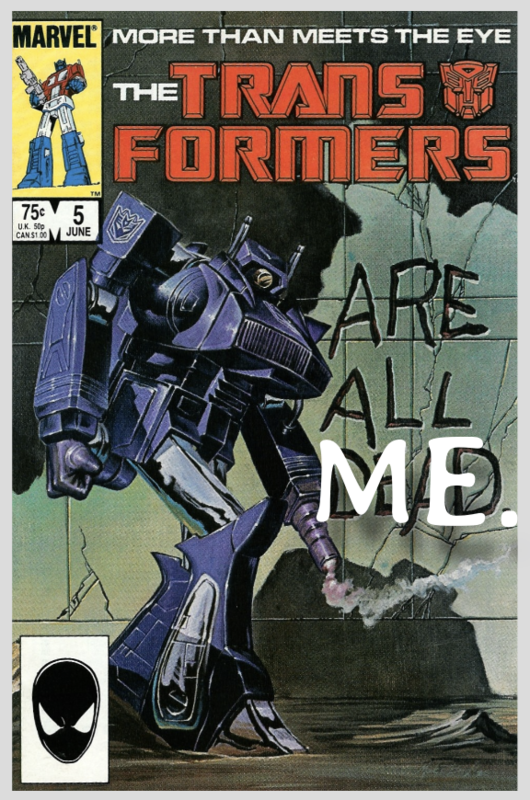 AS WAS PROPHESIZED IN RODIMUS UNICRONUS' INSTRUCTION SHEET! Ah yes, The Book of Instructions. Step 7. Verses 8-11. To uncreate the world, reverse the order of the instructions. .....or is it that [The Mini-Spies]'re such good spies that no one has ever discovered their real names? Uh, they've pretty obviously given them numbers and taken away their names. Lore Way is the best road to take to Seriously, other routes have too much traffic. They haven't given us any more Beast Wars characters, I'd still like a Voyager Dinobot, Tigatron, Terrorsaur and transmetal 2 Dinobot to make a scaled collection. Listen, if your job was to repeatedly fall from the sky while on fire, you'd probably be every religion you could get your Canadarm on. Imagine how much more entertained we all would be if Mike Pence was G1 Starscream and every week with every new controversy "Donald Trump has gone too far! I, Mike Pence, am the NEW President!" Cyclops Daria is my favorite Pacific Rim Jaeger. This man is now in charge of the Department of Justice. He looks like he's preparing to stand in the way of proper photos of the next Transformers Titan-class figure. 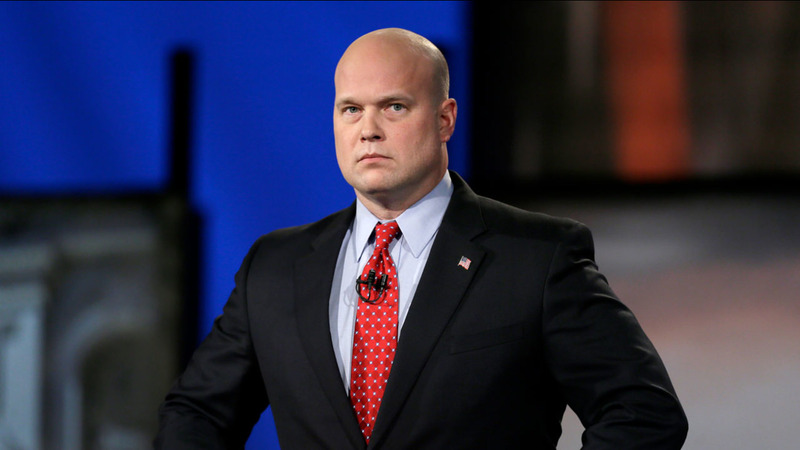 Rob Corddry is now heading up the DOJ? Out of all the Daily show alumni to get a role in the Trump Whitehouse, I would have thought they'd have hired Colbert first. I keep expecting the guy walking across the bottom to get all the way to the right and then set Tom Servo down next to him. I remember by the 4th movie how staged the explosions were. Maybe that's why Cena is in this one. He missed his intro the last 2 times. Got in twice....a new high. This cover hasn't aged well. Honestly, I blame Wreck-Gar. He dared us to be stupid, and Bay simply accepted the challenge. If I was in charge it would be "The Librarian and the Miner". Insert romance novel cover here. Why am I even in this fandom. For the sweet spinster toys! Like Elita One, since she's like 9 million years old and has never married! This board REALLY hates too many quotes in one post. Can't wait till Shockwave tries to name all of the digits in pi. That's easy. 0, 1, 2, 3, 4, 5, 6, 7, 8, and 9. Edited by Maruten, 01 January 2019 - 05:07 PM. One odd thing with the new Wreck-Gar, it looks like I will have to get a new Chainsaw Splatterpus from Trent (this time in orange) so Wreck-Gar can put it down and listen. Wait, the robots in the movies have names? "Yes, most of HC's posts are." what is the history behind var mode anyways? Wow, it's been almost 4 years already. How the vears vly vy. 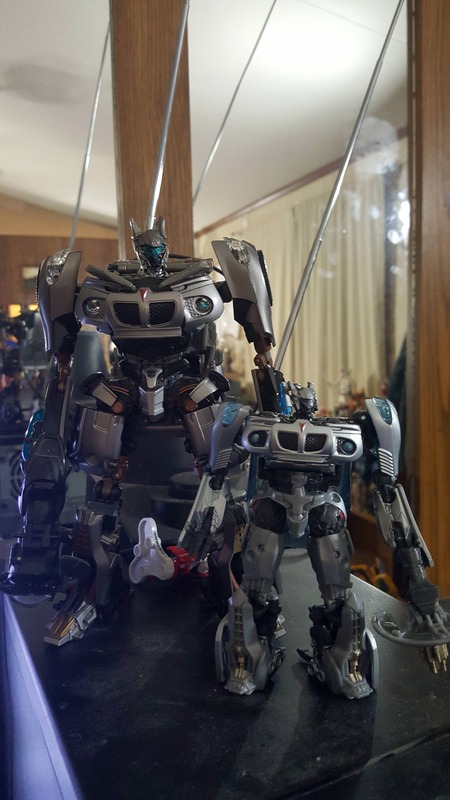 I absolutely hate "third party Transformers". Awful, awful euphemism. You wouldn't describe horsemeat hamburgers as "third party beef", would you? I'll tell you what I would do - start a frigging band called "Third Party Beef". "Noiro" is a great name, in a cheesy Silver Age kind of way, for a guy whose defining characteristic is that he's a black version of someone else. He's Shockwave, he's Shockwave, you're Shockwave, I'm Shockwave! Are there any other Shockwaves I should know about?! "Remember me, Orion?!? When I killed Bumblebee, I talked just... LIKE... THIS!" If I can find a purple-bodied Titanmaster and four blue limbs, I'll give him an inner robot, but I'm not painting one of those things. I've been watching for years. Haven't seen any sign of it yet. The magnificence of Bee Movie has surely made this possible!